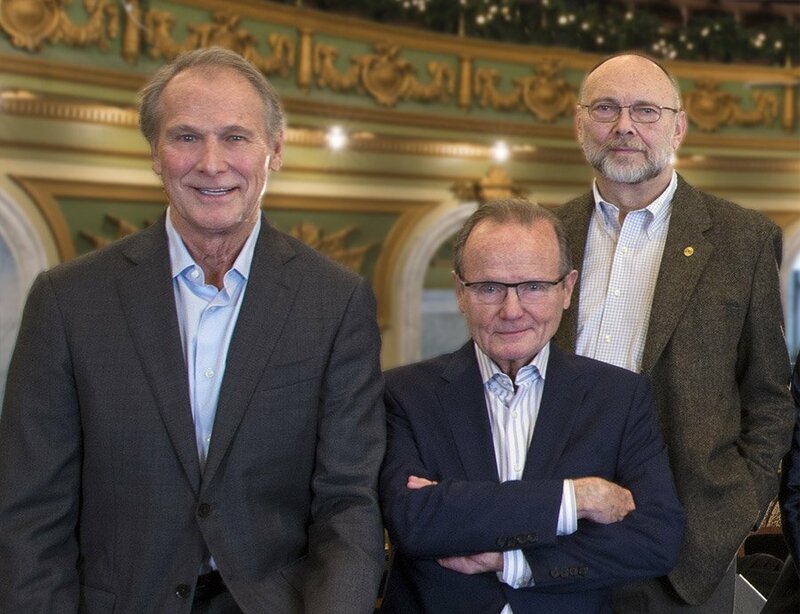 Bill Baumann, Chairman of the Cincinnati Memorial Hall Society (CMHS); Jim Fitzgerald, Trustee & Chair of CMHS Program Committee; Jim Wellinghoff, Trustee of the Annie W. & Elizabeth M. Anderson Foundation which provided funding to establish the Longworth-Anderson Series. Memorial Hall’s glorious architecture has never been in question. The building is gorgeous. And classic. Definitely worth keeping. Each time the subject of what to do with Memorial Hall has come up, everyone agreed on that. But for more than half a century, no one could figure out how to make it economically viable. It had no air conditioning. The heating was fine, but it was noisy. The bathroom facilities were inadequate. The seats were legendarily uncomfortable. Memorial Hall was a lovely Edwardian-era theater with all the Edwardian-era conveniences, meaning that, by most late-20th century standards, it was lacking. You probably already know the story of Memorial Hall. It is that lovely little place with 562 seats just a couple of doors south of Music Hall on Elm Street. It’s really close. Just 85 feet separate the walls of the two buildings. Memorial Hall was the work of Samuel Hannaford and Sons, completed in 1908 as a monument to Hamilton County veterans of the Spanish-American and the U.S. Civil wars. From the time it opened, it stayed busy, in a low-key sort of way. Veterans groups – as many as 22 of them – regularly gathered in the building’s meeting rooms. By the mid-1970s, though, Memorial Hall’s future looked bleak. The veterans groups were shrinking. And the county, which owned the building, wasn’t interested in devoting much cash to the upkeep of an already old building. Besides, the Over-the-Rhine neighborhood that surrounded Memorial Hall was a shambles. Why fix up a building in an area no one wanted to visit? There were spits and spurts during the 1980s. Ensemble Theatre held some of its initial performances there in the mid-’80s. The Kronos Quartet filled the hall in April 1987. Then, in May 1990, Cincinnati Magazine columnist Albert Pyle wrote a humorous article that portrayed Memorial Hall as a far better venue for chamber music than Music Hall. It was a backhanded compliment, but for those who attended performances in Memorial Hall, it had the ring of truth. The Cincinnati Symphony Chamber Players first performed there in 1990, and The Village Waytes a cappella group adopted the hall for a couple of years. The mostly cosmetic upgrade was completed in 1992. The building still had no air conditioning, zero theatrical lighting and sound controls, woefully insufficient bathrooms. In spite of continued, sporadic usage, it wasn’t enough. A few blocks down the street, downtown Cincinnati was sinking fast. And OTR? Even worse. Once again, Memorial Hall found itself the jewel that no one wanted. Then Bill Baumann came back to town. Early in his career, Baumann was a high-flying executive with Cincinnati-based Taft Broadcasting. One of his particular interests was Taft subsidiary Hanna-Barbera Productions, the creative force behind animated entertainment such as Yogi Bear, the Smurfs and the Flintstones. But in 2009, he came home to Cincinnati. As coincidence would have it, shortly after his return he attended a memorial service for attorney Peter Strauss, a former Cincinnati City Council member and vice mayor. The gathering was in Memorial Hall. A year later, in the spring of 2011, Marge Hammelrath, president of the Memorial Hall Society, called to ask if he would be interested in joining the board. It was a turning point, both for Baumann and Memorial Hall. Baumann didn’t intend the building to completely take over his life. But very quickly, it did. He’s an entrepreneurial guy, after all. He likes to make things happen. He was the one who introduced Cincinnati to Diner en Blanc in 2012. Baumann’s timing couldn’t have been better. Over-the-Rhine was already on its way to becoming a destination. Not just restaurants and bars, either. There were honest-to-goodness anchor institutions. Ensemble Theatre was already established on Vine St. The Art Academy had relocated to Jackson Street in 2005. Know Theatre moved across the street a year later. Then came the new School for Creative and Performing Arts, the renovation of Washington Park, and the then-pending work to be done on the Central Parkway YMCA and, of course, Music Hall. And the streetcar would soon be coming, too. If there was ever a moment to invent a new Memorial Hall, this was it. In some ways, gathering the money to make it happen was the easy part. Baumann was working with a group of gifted and well-connected do-gooders. And I mean that in the most sincere sense. “These were people who dearly wanted this project to work,” says Baumann, rattling off a long list of names that includes Jim Fitzgerald, Jim Wellinghoff, David Klingshirn, Karyl Cunningham, Ken Jones, Kenneth Schoster, Kimberly Starbuck, Peter Koenig and architect John Senhauser. In 2006, they formed the Cincinnati Memorial Hall Society (CMHS), a nonprofit dedicated to the building’s well-being, and later the Friends of Memorial Hall support group was established, in part to set up an endowment for future programming. Unlike the renovation in the 1990s, this renovation would constitute more than architectural triage. This time, the early-20th century gem would be upgraded to a 21st century performance space. A transformative 2015 pledge from the Anderson Foundation put fundraising over the hump. To acknowledge the gift and the prominence of both the Anderson and Longworth families in Cincinnati history, Memorial Hall’s theater was renamed the Annie W. & Elizabeth M. Anderson Theater with the Longworth Anderson Stage. CMHS will curate a new cross-genre, contemporary music performance series, funded by the aforementioned endowment, to be known as the Anderson-Longworth Series. 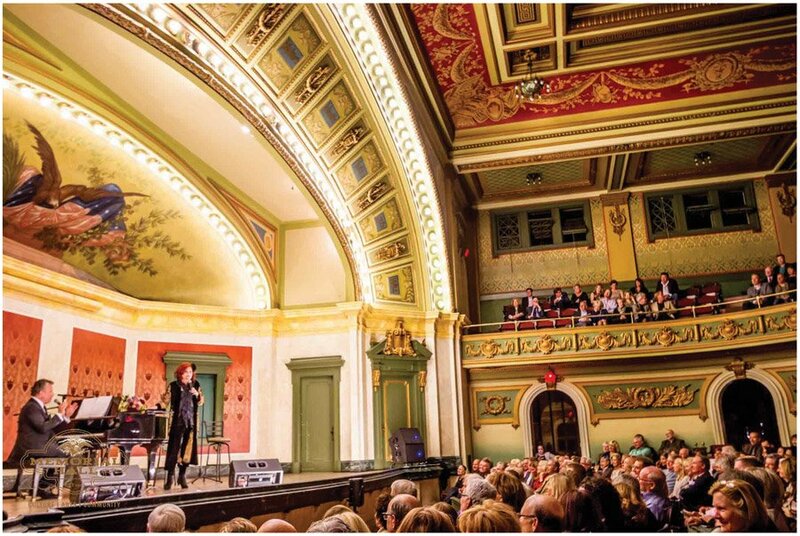 Singer-songwriter Rosanne Cash will open the series Feb. 10, followed by Pink Martini (March 9), songwriter-guitarist Richard Thompson (April 7) and singer-songwriter Sarah Jarosz (June 9). 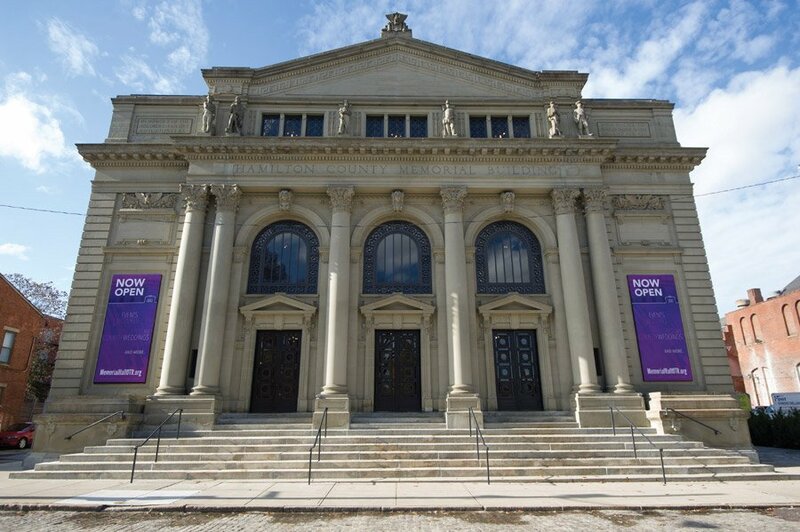 Memorial Hall reopened in December after a 19-month, $11 million refurbishment. It’s one thing to restore a beautiful space, but being financially viable is a different matter. It’s not enough to host a performance every few weeks. Or a couple of wedding receptions a month. If Memorial Hall (dubbed “The MEMO” on its new website) is going to succeed, it needs to operate with the professional savvy of a place like the Aronoff Center for the Arts. Or Riverbend. “I think that’s why they hired Joshua Steele,” says Bill Baumann, chairman of the Memorial Hall Society. The “they” he’s talking about is the Cincinnati Center City Development Corporation, commonly known as 3CDC. That’s the group that will run day-to-day operations. Steele, the 33-year-old entertainment gadfly who will manage the hall, is a man who comes with many skills and has had more than his share of high-profile positions in the area. A Northern Kentucky University graduate, he’s done everything from managing the Vocal Arts Ensemble to running the theater program at The Carnegie in Covington. He’s a singer and an actor and writer/director, having co-created several oddball productions with local performer Mike Hall, his partner in Hugo West Theatricals. Every time you turn around, Steele is there, in some capacity. With this Memorial Hall position, he has his hands full. He knows Memorial Hall’s history, but he doesn’t really spend much time talking about it. He’s the guy who is looking to the future – to next year, next month, even next week, if there happens to be an open date. Like any good all-purpose space, Memorial Hall will have to find a way to be all things to all people. Thanks to 3CDC’s investment in up-to-date theater technology, it’s likely to work quite well. A quick glance through one week in February reveals what is to come: an Eli’s-catered “Play with Your Lunch” (Feb. 8), Rosanne Cash, with Joshua Leventhal (Feb. 10), Children’s Theatre performing “Harriet Tubman” (Feb. 11), and Oscar-nominated short documentaries presented by Cincinnati World Cinema (Feb. 11-12). Variety. Lots and lots and lots of variety. They’ll continue their partnership with Cincinnati Shakespeare Company’s Project 38 program, too, where they host high schools offering their own interpretations of Shakespeare’s 38 plays. There’s talk of a generous chamber music component, as well. And it’s expected that the CSO’s MusicNow programming will continue to call Memorial Hall home.